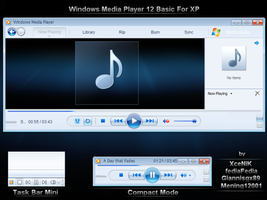 'Show Desktop' is a small portable application, inspired by Windows 7 Aero Peek, that creates a small rectangular button at the right side of the user's taskbar that not only replaces the original Windows 7 Show Desktop Button, but also adds tons of features. 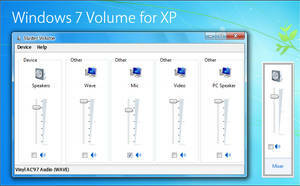 For those using Windows Operating Systems, 'Show Desktop' is fully compatible with Windows XP and Vista, and provides all of the features that can be found on the Windows 7 Show Desktop Button, and more. 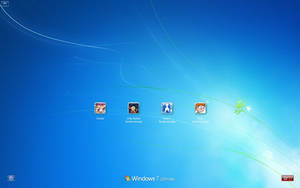 'Show Desktop' is greatly customizable, in that it allows the user to change the application's settings to their liking. 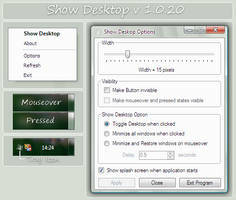 'Show Desktop' also gives the access to Shutdown options directly from the Show Desktop Button. These options allow the user to easily switch users, log off, lock, sleep, shutdown, restart, and hibernate their computer straight from a menu accessible from the button itself. 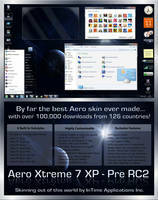 • 'Aero Peek' support for Windows XP, Windows Vista, and Windows 7 with customization. • 'Toggling the Desktop' and 'Minimize Windows' features that allow the user to choose the method in which open windows are minimized. 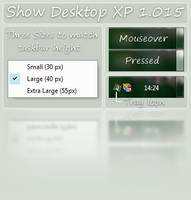 Show Desktop XP is exclusive to Aero Xtreme 7 XP . You may NOT package it with a theme or any other work without my or IanITAInc's permission. However, if you want to feature 'Show Desktop', you can simply simply post a link to this page. Many thanks to IanITAInc, PeterRollar, ptukey, s0be1t for extensive testing. Well, the house is a shambles, the front steps and sidewalk have yet to be shoveled after an overnight snowstorm, holiday stuff is scattered everwhere and there are about a half dozen messages on the answering machine that haven't been played back. My wife is at work, and I should be busy myself, editing technical manuscripts that are due quite soon and picking up around the house, but I can't bring myself to bother with any of it. I've put my entire life on hold for no other reason than that I've found a new toy I simply can't stop playing with. 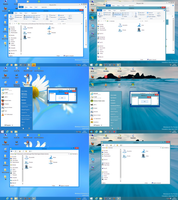 It's a Windows executable called Show Desktop developed by DeviantART's own *Cellular [link] . 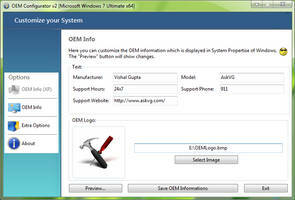 It's an amazing little standalone app that consists of a small button positioned to the right of the Windows taskbar. When clicked , the button minimizes all windows currently opened on the desktop. If the small rectanglular button is right-clicked, a compact menu appears that offers some very big options which are quite useful. Not only is it possible to personalize the application's settings (splash screen on/off, button width, etc.) but the user is also offered the option to log off Windows, switch users, go on standby, enter hibernation, or even shutdown or restart their system. thought I'd witness on a lowly XP machine. And the amazingthing is, it works! I did have to fish around a bit, mousing over the button once or twice the first time I looked for it till I found the 'sweet spot', but once discovered, the function is very easy to relocate. environment. I very highly recommend this amazing app with the tiny footprint, but, if you will accept a word of warning, do not install it until after the sidewalk is shoveled and your household chores are attended to, because once you begin playing with Show Desktop, it's incredibly easy to lose awareness of your surrondings or even space/ time itself..
12 out of 15 deviants thought this was fair. This is literally the best thing that's ever happened to me on Vista. Personally, Windows 7 is too expensive. 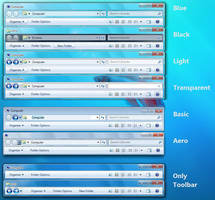 So I turned Vista's Taskbar into a Win 7 Look-Alike. Thanks! You deserve a lot more than a Fave for inventing this. Great. 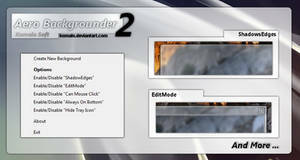 Can you make it compatible with autohide option for the taskbar? It isn't smooth going down. And also an option to set the height because some of it is still shown when the taskbar is set on autohide. Thanks for a great app! Using it on Windows 8.1, since the button is removed in them. I found only one disadvantage—one can‘t set custom reflection image. The application failed to initalize properly (0xc0000135). Click on OK to terminate the application is the error I get on XP. OMG....was searching for this a long time. Thank you very much! +1 internets for you, sir! why 4.0! i have 3.5, sadly. HOW DO I DELETE THIS LOAD OF TURD PROGRAM. 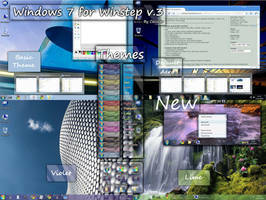 Please, make it compatible winth Windows 8, after screen rotating or exiting from hibernate state in crashes! it's been a long time since an update. glad to see its out, even if i don't use XP anymore! I don't understand. What command are you referring to? 1.Great work you've done with this! 2.how can I add the rainmeter skins on my desktop to the black list? They get caught in the peek function. Could you add the ability to add to the black list with out having to choose from the list because rainmeter skins dont show. I'm on winXP if you that helps. "A new guard page for the stack cannot be created." Interesting. Can you tell me what you were doing when this occurred, and how often it occurs? not very often.. its happened maybe 3 times since using your updated Show Desktop Application. I am running 'Atomic Alarm Clock', a tray replacement clock for the standard windows clock, which I just realized might be the cause of it, not sure however. maybe a run-time error or similar. I really have no clue, but I will keep an eye on it and keep you updated. Other than that the program works flawlessly. Do you have the 'Prevent System Tray From Overlapping With Button' setting enabled? I didnt have that option checked, but now I do. Maybe this was what was causing it? I was actually thinking that having that checked might have been what caused it. Can't figure out what's causing it. Really there's no place for a stack overflow to occur while the program is idle. For now, I've downloaded 'Atomic Alarm Clock', and hopefully I'll be able to recreate the bug. Thanks for giving me the heads up about it. Awesome job on the update! This app is now a must-have for my XP machine. Cool Update Looking forward to its new look! If possible i would fave this a second time. Thanx for all your work to make this perfect. It was only a very small help, but thanks anyways. Is there source available anywhere? I'd like to contribute. If not, are you taking suggestions? The only feature missing is the minimizing that happens when dragging text/files/bookmarks over the button. I wouldn't mind implementing. No, I haven't released the code. But I'm actually working on it right now. But I'm a little confused. You're saying it should minimize when you drag files(or pretty much anything) over the button? Yes, allowing you to drop that file/anything onto the desktop. 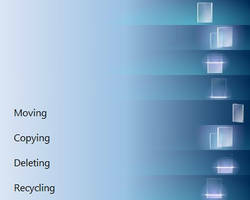 Similar to dragging a file or text over the taskbar in XP. Windows 7 moved this functionality to its "show desktop" button though, instead of allowing you to drag anywhere on the taskbar like XP. Glad to hear you're still working on it!